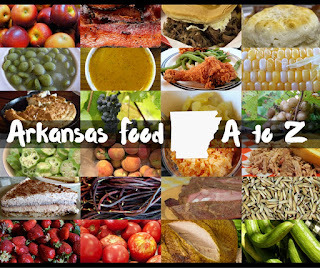 VIDEO: New Food Items at the 2016 Greek Food Fest in Little Rock. 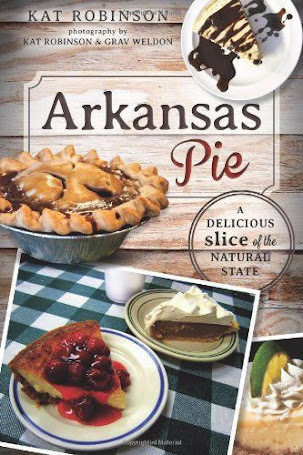 Check out the new items you'll find at the Annunciation Greek Orthodox Church during the 32nd Annual Greek Food Fest in Little Rock, May 20-22nd. Click on this map to see a bigger map and plan your trip. one happened way back in 1985. Somehow or another, the good folks with the Annunciation Greek Orthodox Church manage to keep things going on their lot on Napa Valley Road in Little Rock. And every year you get to try all sorts of great Greek cuisine. 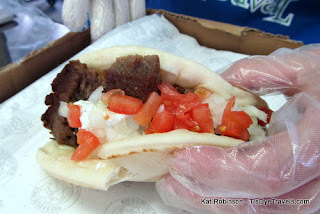 I can recall having my first gyro at this festival more than three decades ago, watching that cone spin as an expert cook sliced off the meat. I may have had my first baklava at the festival, too, and I certainly tried my first bite of pastitsio there. These days, the menu is much, much bigger. See what was new and great at last year's Greek Food Fest. There are three great new items on the menu this year, and my lovely friends at the Annunciation Greek Orthodox Church invited some of us (including Little Rock Foodcast's Steve Shuler, Debbie Arnold of Dining with Debbie and Jess Ardray from Little Rock Soiree) in to try these new eats. The video here will tell you a little bit about what we ate (thanks to my pal Leif Hassell for filming this piece - and yes, there will be more to come and next time I'll wear a little makeup too). The first of these items: the Lamb Burger. 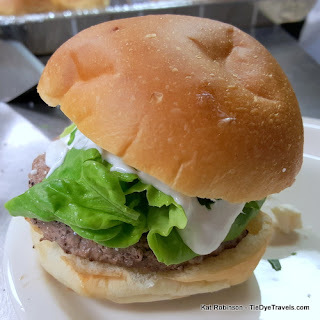 This is a third pound burger served up on an Arkansas Fresh Bakery bun with tzatziki sauce, green leaf lettuce and Feta cheese. 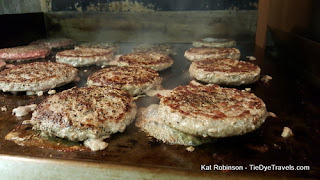 The burgers are spiced with Greek seasoning (Arkansas's own Cavender's Greek Seasoning is part of the blend). The buns are pliant and the overall effect is marvelous. I've had some great Greek-seasoned burgers before (the Lamb Burger at Tusk and Trotter in Bentonville is the best I've encountered so far) and these stand up well. Yeah, I'll be having another one of these this weekend. The second item: Greek Fries. 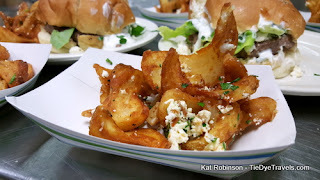 The cooks take Sidewinder Fries (a thick-cut, battered spiral-cut potato creation) and top them with fresh herbs and Feta cheese and serve them with tzatziki sauce as a dip. 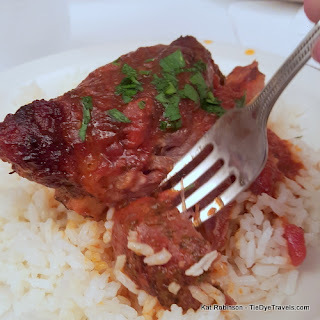 The overall effect is amazing - these aren't just a Greek nacho-style dish, they're a quick and hot conveyance of delicious flavors with a little dill and mint in the background. They're a winner in my book. 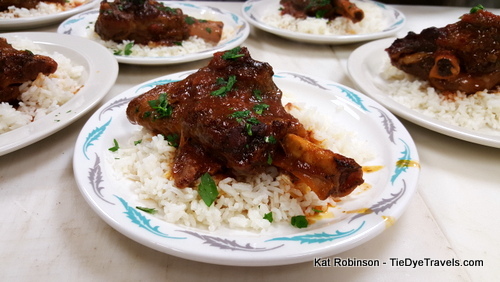 The third item: Lamb Shanks. Okay, these are my favorite by far, and this year's most expensive item at $14. But it's worth it. Each shank is marinated in red wine, tomatoes and herbs, braised and roasted for a total of four hours, on the bone. 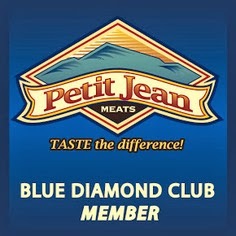 The dish will be served with both rice and green beans at the festival. How good is this? I was chewing bones and sucking the marrow while asking questions at our preview. So very good, which is why I probably won't be sharing. Sorry guys. 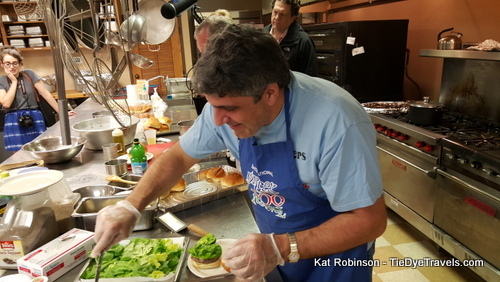 Of course, most every dish ever served at the Greek Food Fest will be coming back this year. Last year's addition of saganaki (that fabulous flamed cheese dish I could not get enough of) was so popular the church ran out, then went and bought up all the cheese and made more overnight, then ran out AGAIN! 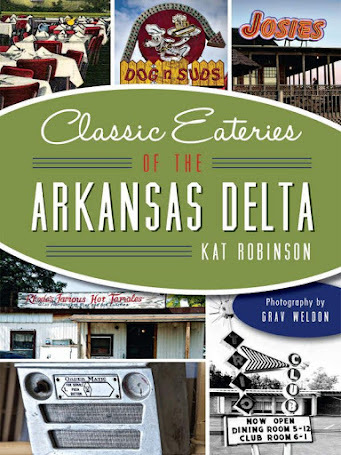 It's back, as are those fabulous Greek "doughnut holes," or loukoumathes. There were some seriously surprised patrons last year who came in on Saturday afternoon to find all the pastries gone. 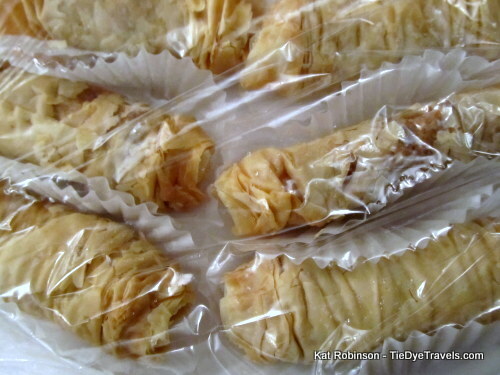 The baklava, sourota and those incredibly rose-tinged wedding cookies I adore, all ran out, despite an increase in efforts boosting the number to 26,000 pieces for 2015. Jason Chacko, who talked with us at the preview, says there's been a day-and-night operation underway since December with two shifts of volunteers to create a new record 40,000 pastries for this year's event. 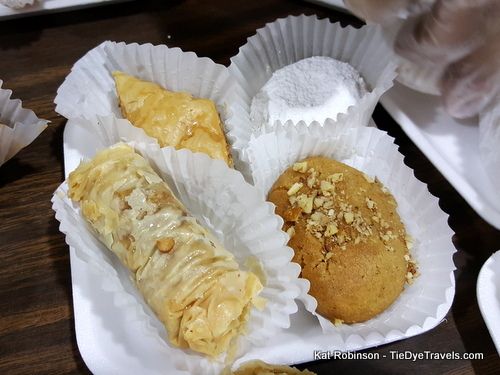 Still, I'd highly suggest going early and going often to the Greek Food Festival - and purchase your take-home pastries early. As always, there will be great performances of Mediterranean dance throughout the weekend, and lots of vendors offering everything from nesting dolls to those really cool Greek fisherman hats. Something I strongly suggest - even if the weather is absolutely perfect, go take the tour of the church. It is gorgeous and remarkable. 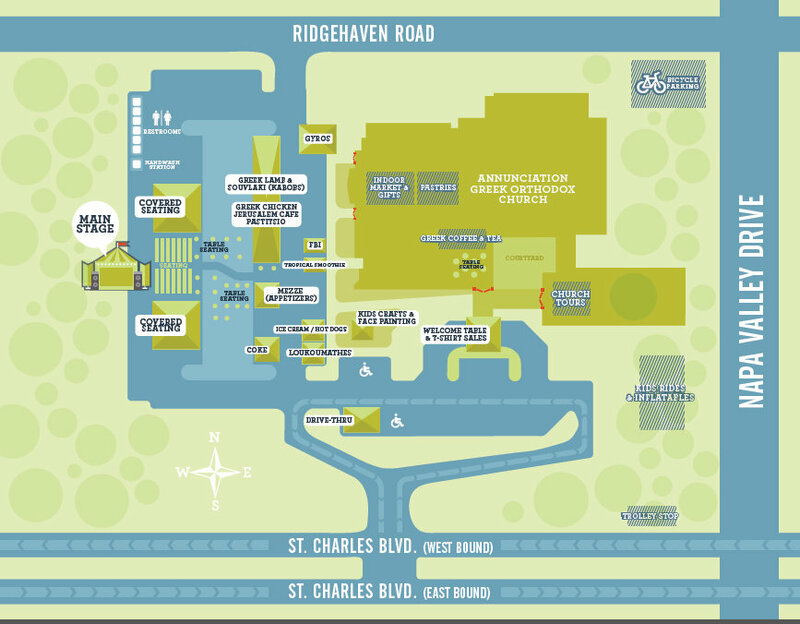 There's even a self-guided tour you can take with your cell phone these days. It's absolutely worth it. foods you'll find on site, and details on how you can have your own taste of Greece delivered to your home or office via Chef Shuttle. 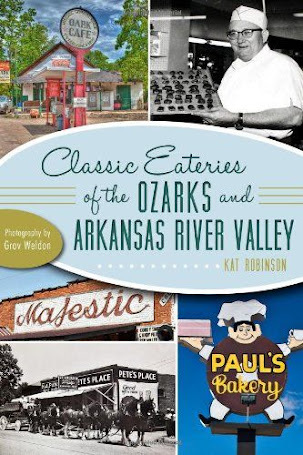 The event is this weekend, May 20-22nd, and it starts at 11 a.m. Friday morning. 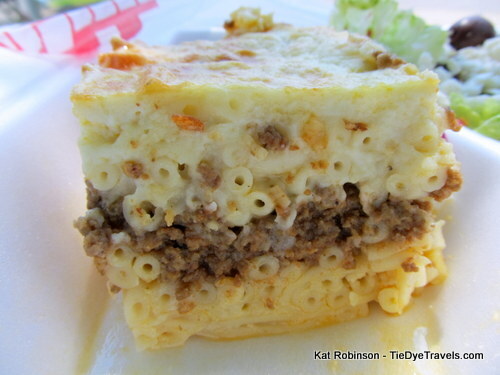 You'll have to stand behind me for that first slice of pastitsio. 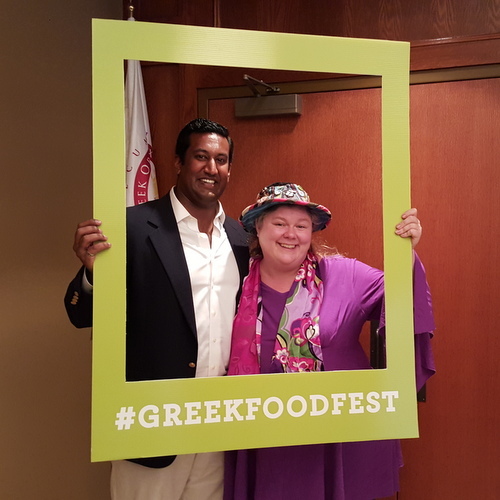 Oh, while you're making your plans, go check out Jess Ardray's piece on Jason Chacko, the generous and fascinating young man who's been working to promote the Greek Food Festival to a new generation, at Little Rock Soiree.